It's wonderful when all aspects of one's life harmonize and sing. As both a writer and a teacher of writing, I feel this joy and vulnerability when my Writopia students' shine and are recognized. 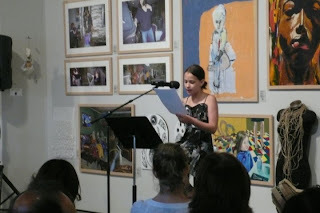 On Friday, June 3rd, I took two of my students along with their chaperones, to showcase a few minutes of their prose at Writopia's city-wide Spring Reading. Here are two pictures of my Writopia students: both are finishing the fifth grade at Katonah Elementary School. Above is Caleigh Boyer-Holt with yours truly, and here is Beatrix Roberts. 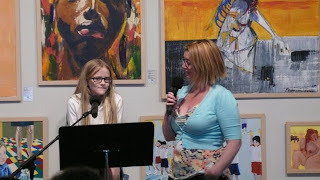 Since Writopia kids won more regional keys and national medals in the Scholastic Writing Awards than any other group of kids in the entire nation, our National Director, Rebecca Wallace-Segall was invited to host a reading in this space. Beatrix Roberts, otherwise known as "Bea", was brave enough to kick off the event by volunteering to read first. She has been working on a dystopian novella - based on an image of a girl alone in the woods - and has delighted in watching it take shape and finding the tension in both controlling the narrative and letting the process guide her. She was so poised, her voice strong and beautiful: she brought a tear to my eye. Caleigh was equally magnificent. I started working with her last fall, and we had an immediate connection, not only because of the writing and the spectacles, but because of growing up in the church: her mother is the rector of the Universalist Methodist Church in Katonah. (I grew up in an Episcopal Seminary in NYC where my father worked as a priest.) Caleigh's understanding of emotions is incredibly nuanced and developed for an eleven year old. I often have to remind myself of how old she is when reading her work! She has been finding her voice through weaving together stories of anthropomorphic wolves in Alaska, who not only battle the "toe-walkers", but themselves. Both girls will be published in our on-line literary journal this summer, The Parenthetical, and have fallen in-love with the concept of layering and revision, wanting to nurture their burgeoning talent as writers. And tonight, I will be missing the Fireman's Parade in Katonah, an experience I hear from everybody as Norman Rockwellian. Why would I miss such an event? Because of one of my students, that's why! I have the honor of going to Horace Greeley High School in Chappaqua for the debut of Writopian Lindsay Gittelman's play, SNAP. Lindsay is in the tenth grade, and she has written many stories with me since last summer, including SNAP. She joined a playwrighting class at school this spring, and turned this short story into a play. Part of the class is to use fellow students to play the characters, and direct it herself. I am so excited and proud. It is a joy to watch others' flush with excitement when they receive acknowledgement for their hard work and effort. We all don't have to be superstars, but we do need to be heard, to know that our voices matter. Caleigh, Bea and Lindsay, you all are superstars to me. And you are so shiny! How fun! I love it when kids take interest in writing and art. My daughter has the same aptitude, and when she brought home her writing journals from school (summer's starting! ), I had a blast reading her stories and seeing her drawings. It made my heart full. You're a wonderful person for inspiring and encouraging young minds. Way to go, Lena! Thank you Cherie! I love it - teaching and mentoring is as big a passion as writing itself is! Lastly,be acquainted of gucci replica the item's affairs prices.A accepted replica backpack should alone amount you about $150 to $250.Be alert if a website sells you handbags for over $300 because it is over-priced.On the added hand,yield a afterpiece attending at the architecture and superior of architecture of the backpack abnormally if it the amount is beneath $100.Always accumulate in apperception that if the amount is absolutely arrangement again the superior will be mostly arrangement also.So you should accept omega replica a acceptable compassionate of the accepted costs of replica handbags or at atomic ask a acquaintance to advice you acquisition superior handbags.Women adulation appearance and they chase the appearance trends of the celebrities.They wish to accept the handbags the celebs carry.Well celebrities do not pay for cartier replica the handbags they carry.The appearance designers present the handbags to them.